Velodyne has shipped a cumulative total of 30,000 lidar sensors with a total value of half a billion dollars. This achievement underscores Velodyne’s lidar market leadership and ability to deliver a broad portfolio of lidar sensor products at mass production levels. Velodyne is the highest volume supplier of lidar sensors to the automotive industry with more than 250 customers globally. Lidar sensors are a central component of autonomous vehicles (AVs) and advanced driver assistance systems (ADAS). Velodyne’s sensors are used in a myriad of new technologies and rapidly growing industries, including unmanned aerial vehicles, delivery services, mapping, industrial safety, robotics, security, marine uses, and more. “We broke through this milestone because the Velodyne team develops the smartest, most powerful lidar solutions. Velodyne created the world’s first in-house automated manufacturing processes to produce automotive-grade lidar products at scale,” said David Hall, CEO and Founder, Velodyne Lidar, Inc.
Velodyne’s product portfolio meets the needs for autonomy and driver assistance, providing the real-time perception data that enables safe and reliable operation. 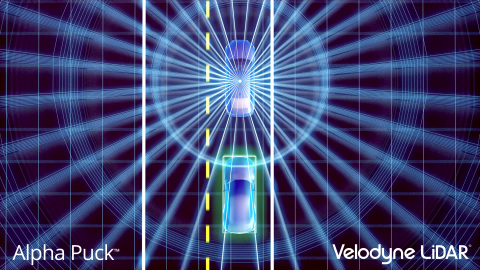 Velodyne produces both directional and surround-view sensors with best-in-class range and resolution. The rich computer perception data provided by these sensors allows immediate object and free space detection for safe navigation. Velodyne’s manufacturing operations include a 200,000 square foot megafactory in San Jose, Calif., where highly-automated robotic assembly techniques are utilized to build a range of sensors. Invented by Velodyne, these revolutionary manufacturing systems form the foundation of the company’s mass production capabilities. Velodyne is also scaling production by licensing core lidar technology to Tier 1 supplier Veoneer for a long-term, high-volume manufacturing agreement with a global automaker.